...is the remedy for known fears. In other words whenever you are frightened of something or you are anxious about something, and you can say what that something is, then Mimulus is the remedy to take. Mimulus fears are everyday fears - fear of public speaking, of the dark, of aggressive dogs, or of illness or pain. 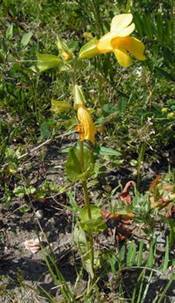 Phobias such as the fear of spiders or of birds are also Mimulus fears, since the cause of the fear can be named. Where the phobia is very great so that the sight of a spider for example causes sheer terror, then Rock Rose might be given as well as or instead of Mimulus. And where the fear is diffuse and there is general anxiety and apprehension without a specific named cause then Aspen is the remedy to consider. Mimulus is used as a type remedy for people who tend to be nervous, timid and shy generally. Sometimes people of this type may blush easily or stammer, and they will usually avoid social occasions and any event where they will be in the limelight. Mimulus is the remedy to encourage the quiet courage and strength that lies hidden in such people, so that they can face the everyday trials of life with steadfastness.